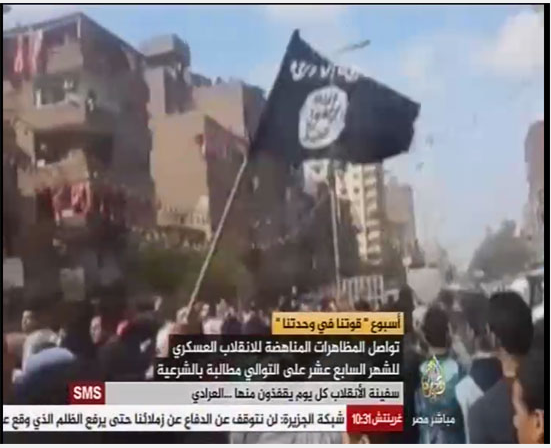 Muslim Brotherhood raising ISIS flags in Cairo, threatening Egyptian citizens with further bombings and slaughtering. 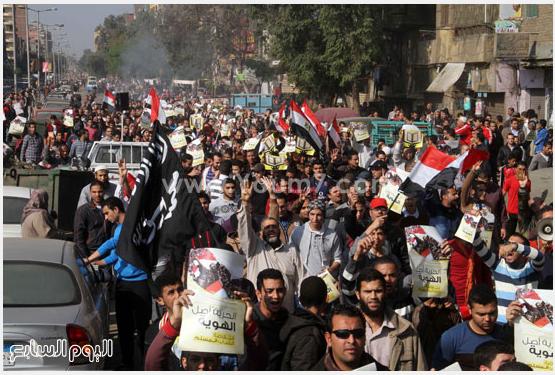 Muslim Brotherhood carried ISIS flags on the 25th of Jan 2015, and in all their previous armed violent demonstrations, that always end up by failing attempts in creating chaos, through burning public and private properties, terror attacks against citizens, and against armed and police forces. 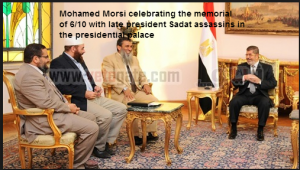 Muslim Brotherhood is targeting from their failing terror attacks, to give an image and impression to the entire world, that Egypt is not safe and unstable, and that the security situation is getting out of control from the armed and police forces, which is not true. 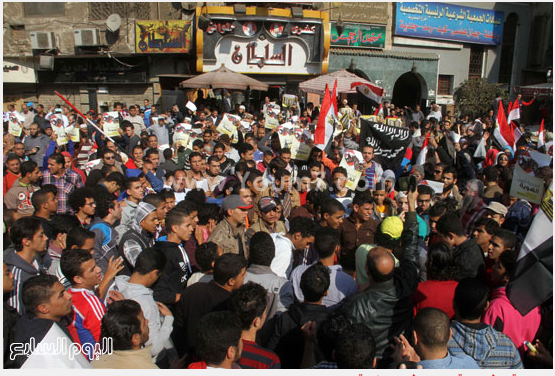 The target of Muslim Brotherhood is to hit directly the Egyptian economy. Despite the terror attacks of Muslim Brotherhood terrorist organization and their militia, people in Egypt live a normal life and it doesn’t stop them from practicing their daily routines. Police and armed forces are working with their utmost vigilance and they are successfully making pre-emptive terror strikes on a daily basis and they are successfully suffocating terrorism. Muslim brotherhood failed many times in mobilizing their supporters, or to incite the Egyptian citizens to join their armed violent demonstrations, so committing chaos and launching terror attacks using the flags of ISIS and supporting their distorted ideology, is to terrorize people and paralyze the country and hit directly the Egyptian economy. It’s also to give an image to the world that ISIS exists in Egypt, which is also not true. 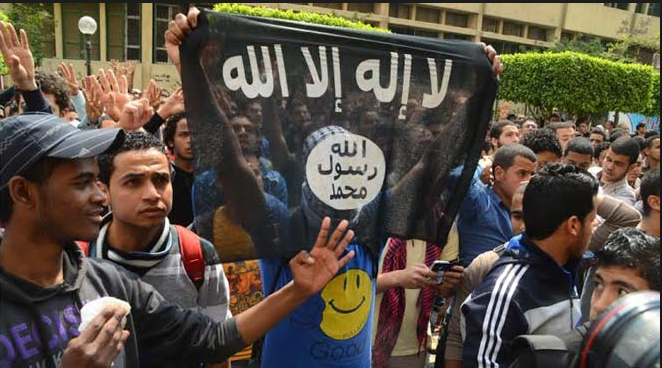 Muslim Brotherhood and Islamist extremists follow and pay loyalty to ISIS and their ideology (MB and ISIS are two sides of the same coin), but ISIS doesn’t exist in Egypt. 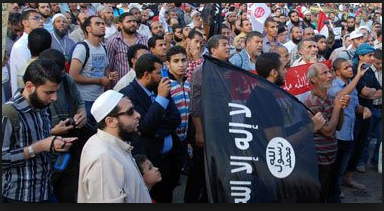 In the following videos, Muslim Brotherhood carrying ISIS and Al-Qaeda flags, saying no more peace in Egypt, and they were chanting the name of ISIS and paid loyalty to apply sharia laws and slaughter any one who will stand against Islamic Jihad. 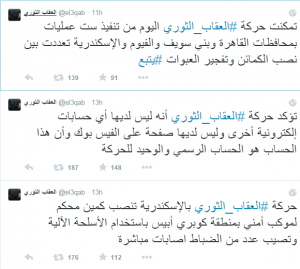 Muslim Brotherhood are using social media and Aljazeera, in inciting their supporters to commit terror attacks in Egypt. 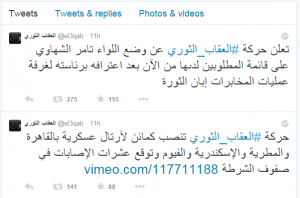 In addition, they publicly publish names and ranks of Egyptian police and armed forces individuals and their families on the social media, including their children and home addresses to target them and assassinate them. 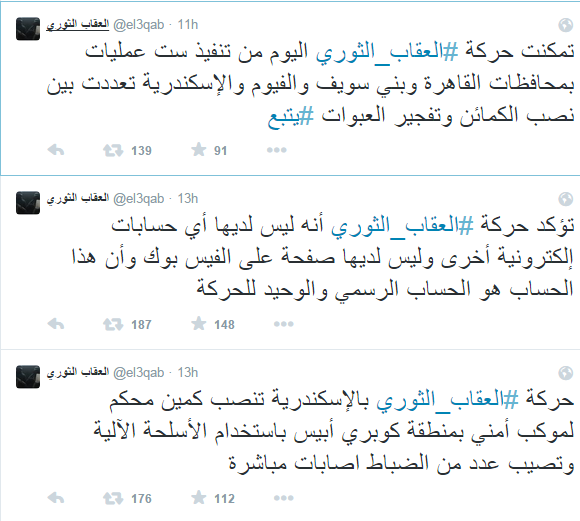 This is also one of Muslim Brotherhood failing attempts to lower the morale of Egyptian armed forces and police individuals, to give the impression that they are getting stronger and in control, in order to create a split in the police and armed forces rows (this is what they succeeded in doing in Syria). Which also explains many failing attempts of Muslim Brotherhood in smuggling and using military and police uniforms that are seized by the security forces. 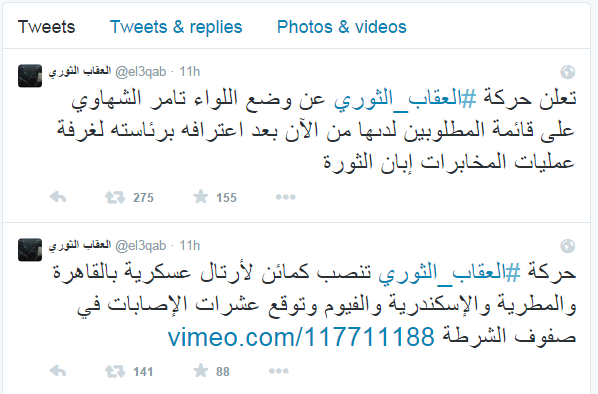 The following is just one example of what Muslim Brotherhood are spreading on the social media. The movement of revolutionary punishment declares, putting General Tamer Alshahawy on the wanted list, because he was the chief of Intelligence operation during the revolution. The movement of revolutionary punishment succeeded in setting up ambushes to military and police convoys in Cairo, Matariya, Alexandria, Fayoum cities. And the result tens of police injuries. The movement of revolutionary punishment launched today 6 attacks operations of ambushes and explosive devices in Cairo, Beni Suef, Fayoum, Alexandria cities. The movement in Alexandria city, targeted today a security convoy on Abiss bridge with machine guns and caused direct injuries to the police individuals. Which brings the question that I address to the social media networks, Why are you participating in spreading terrorism in the entire world, and you are involved directly in the killing of innocents? Why do you allow terrorists accounts on the social media networks, because this is their ways of communicating. Strange that social media networks protecting IP’s of their users, while they are exposing the lives of innocents to terrorism’s danger in the entire world!